BEAUTIFUL ONE DAY.....? at News Aboriginal Art Directory. View information about BEAUTIFUL ONE DAY.....? Unspoken in this ironical borrowing of the Queensland State tourism slogan is a quite different conclusion – DEAD THE NEXT. 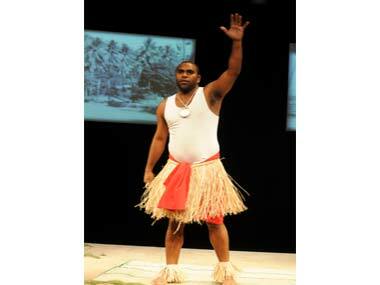 For this new play at Belvoir Theatre in Sydney is another telling of the sad story of the death of Mulrunji (Cameron Doomadgee) at the hands of Senior Sergeant Chris Hurley on Palm Island in 2004. What's different about this version at the joint hands of Melbourne's Indigenous Ilbijerri Theatre Company and Sydney's verbatim kings, version 1.0 from the film based on the book, The Tall Man is that it's really far more about who controls the story than it is about a man's unjustified death. From the beginning, the largely white audience is put on edge with a tale of the black Kylie Doomadgee (Cameron's niece) being accused of stealing a purse at the pub last night – prejudice oozing all over the place, and tarring us subconsciously with the same brush. Later, Paul Dwyer and Jane Phegan – the non-Indigenous version 1.0 team – are constantly corrected about whose right it is to advance the story – even that the time of day/night when events happened is entirely up to the memory of those involved, not objective fact. Only when Ilbijerri's Rachael Maza (an honorary Palmie as her father Bob was born there) is silenced by an extra-legal threat from revealing Hurley's less-then-heroic history, does the worm turn. And then, of course the legal events after Mulrunji's death – a flawed police enquiry, two coronial hearings and Hurley's acquittal on manslaughter charges – are entirely white affairs! Book-ending the 2004 events and their consequences are a lively history of Palm Island 'under the Act', which reveals just why its black inhabitants might have been throbbing with a rage sufficient to burn down the police station after Mulrunji's death, and adds the important information that they originally came from right across Queensland and the Torres Strait – plus a bit of back-birded Islander – they call themselves Bugaman (unhelpfully spelt Bwgcolman) to explain their multi-tribality. Afterwards, to the accompaniment of tropic paradise images, we get a poorly-enunciated coda from the Palmies attempting to answer their own question, “When can we sit at the table?” with propositions that just might have pleased Noel Pearson in terms of standing industriously on their own two feet. Were the cast really invested in what they were saying? 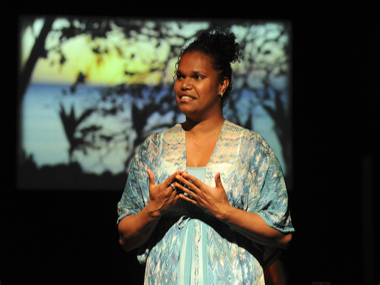 There'd been no doubts about that when Kylie Doomadgee let fly in a feisty tirade that literally set us back in our seats...a credit to her Aboriginal Centre for the Performing Arts training. Perhaps devisor/directors David Williams and Eamon Flack need to find a few more emotional levels like that. For so much else about 'Beautiful One Day' is so good – such as Sean Bacon's audio visuals, which included a wonderful sequence from singer Shirley Abicair's 1960 documentary, cycling blithely and blondly around the Island in praise of the “bold social experiment” that was attempting to assimilate Palmies – well, the ones who didn't have to be exiled at gunpoint! It clearly underlined the central point that this was the Bwgcolman version of events. Belvoir is offering an Indigenous double-bill from 29 November, when Leah Purcell opens in Ruby Langford's 'Don't Take Your Love to Town' - running until 30 December. Harry Reuben in full TI mode, with historic images of Palm Island in the background.